FileThis provides cabinets for top-level organization of your documents. You might think of a virtual cabinet as a drawer in your filing cabinet that signifies the first decision you make—which drawer does this go in? (Unless, of course, you’re simply moving on to the next drawer because the first one is full—something you’ll never encounter in FileThis.) Unlike hard copy, though, documents in FileThis can exist in more than one cabinet. For example, your mortgage paperwork can be in both the Financial and Home cabinets. For instant organization, FileThis assigns documents to cabinets for you. You can move documents to different cabinets, create your own cabinets, and delete cabinets. Note: Documents automatically delivered from your Accounts are automatically placed in their respective account. You can add these documents to cabinets as well. The Accounts you set up in the Connections tab are listed at left, between the Cabinets and Tags. When you upload a document, FileThis attempts to automatically assign the document to the most relevant default cabinets and apply relevant tags. Automatic filing works especially well with predictable, repetitive documents such as bank statements, insurance policies, utility bills, and the like. Default cabinet: Each documents is automatically filed in one or more of the default cabinets according to its content. If you upload a bank statement, for example, it will be filed in the default Financial cabinet. An electricity bill will be filed in both the Home and Utilities cabinets. Uncategorized and Untagged cabinets: FileThis may not be able to determine the content of documents that have imprecise file names and no text; you will need to tag those documents yourself. It may take a few minutes for FileThis to determine the content of a document and automatically tag it. To see the results, you may need to refresh FileThis by clicking the Refresh button to the left of the search bar at the top of the Documents tab. To check the cabinets that recently added documents are filed in, select a document in the Recently Added cabinet. Scroll through the Cabinets list to see which cabinets are checked. 1. Use the search tools to display the documents you want to assign to a cabinet. 3. Drag the documents to a cabinet name; release the mouse button when the green plus sign displays. The box next to the cabinet name is checked. Tip: You can also simply click the button next to the cabinet to assign it to the selected documents. A blank box indicates that none of the selected documents are assigned to that cabinet. 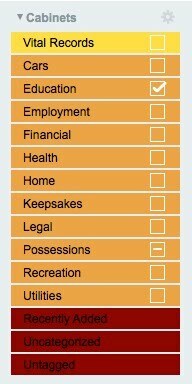 A checked box indicates that all the selected documents are assigned to that cabinet. A hyphen in a box indicates that one or more of the selected documents is assigned to that cabinet. To assign all the selected documents to a cabinet, therefore, click the box until a checkmark displays. To remove all the selected documents from a cabinet, click the box until it is blank. Use the three smart cabinets to get and stay organized. For example, as soon as you upload documents, you can look in the Recently Added cabinet to view the documents and review its cabinet and tags. FileThis provides “smart cabinets” that update as necessary and make it easy to manage documents. Recently Added: Any documents you have uploaded in the last 24 hours display in the Recently Added cabinet. The documents will remain in this cabinet for 24 hours regardless of other cabinets you assign them to. Uncategorized: Any documents that are not assigned to a specific cabinet are stored in the Uncategorized cabinet. Untagged: Any documents that are not tagged display in the Untagged cabinet. Note that you cannot edit the names of or delete the smart cabinets. FileThis provides a variety of default cabinets, but you can create as many as you need. Just keep in mind that cabinets are the top level of organization—sort of a “super tag”—so you don’t need to create a cabinet for every single type of document you might have. Just create cabinets for broad categories such as Home, Car, etc. 1. Click the Edit button in the Cabinets area; a field displays at the bottom of the Cabinets area. 2. Enter a name for the cabinet in the field and press Return/Enter or click New. The field remains active so you can create additional cabinets. 3. When you’re finished creating cabinets, click the Edit button again to exit the edit mode. To edit a cabinet name, click the Edit button. Click in the field containing the cabinet name, type a new name, and press Return/Enter. Click the Edit button again to exit the edit mode. The documents that were assigned to the cabinet remain in that cabinet. Note: You cannot edit the names of the smart cabinets or Vital Records. To delete a cabinet, click the Edit button. Click the red minus sign next to the cabinet name, then click OK to confirm the deletion. Click the Edit button again to exit the edit mode. The documents remain in FileThis and you can find them in any other cabinets they were assigned to or in the Uncategorized Cabinet. Tip: Alt-click/Option-click the minus sign to skip the confirmation dialog box.